Welcome to the Thirty Fifth Edition of the Owen Guns Bulletin. 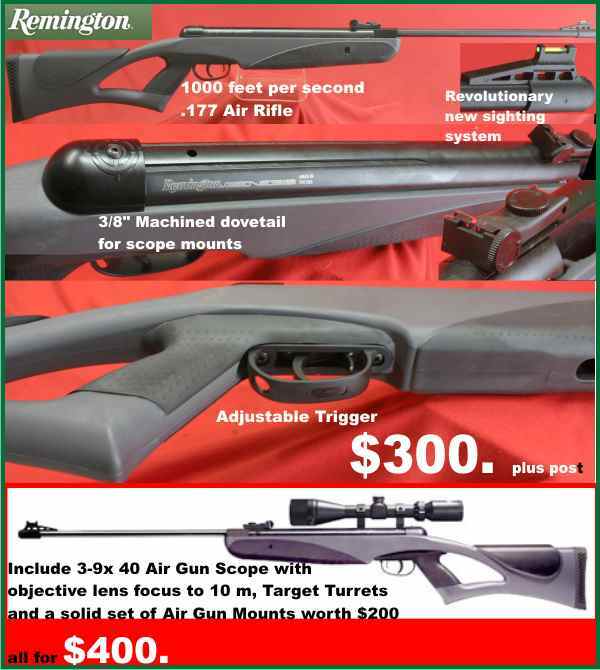 Ideal for Dad and Son, An Adult Air Rifle, Practice Target Shooting in the Garage. 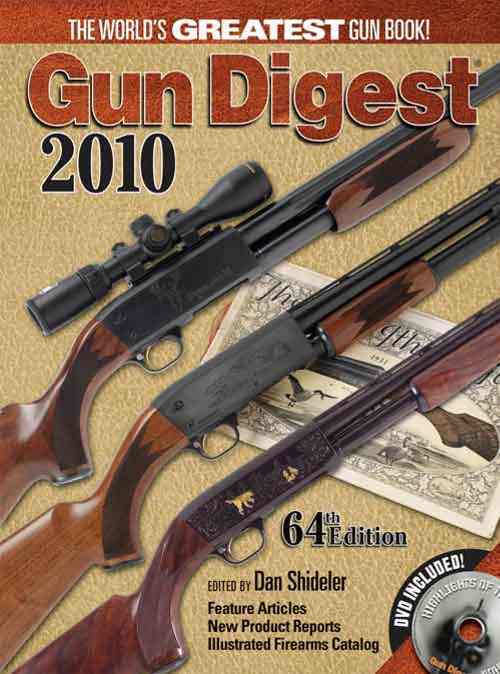 Another good example is the Guns Digest 2010 64th Edition. $50 plus $10 post anywhere in Australia. Gun Digest 2010 is your No1 source for:Test-fire reports from the field,Illustrated firearms catalogue with current arms & accessories,New product reports and feature articles,Arms trade directory find American suppliers quickly and easily.Gun Digest 2010 brings together into one easy-to-use resource the details found in many manufacturers’ catalogs, product reviews from the top gun writers and authoritative articles from leading industry experts. 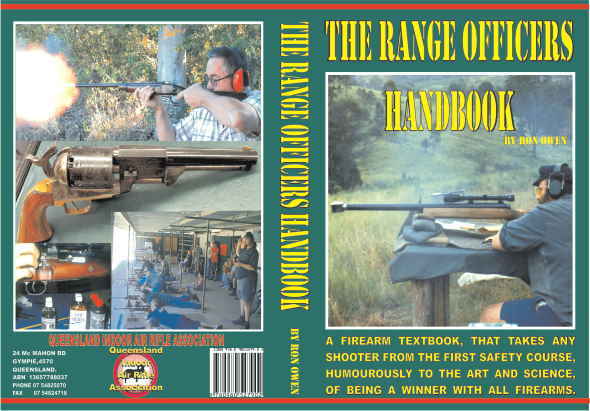 This is what has made it “the world’s greatest gun book” for 65 years strong. 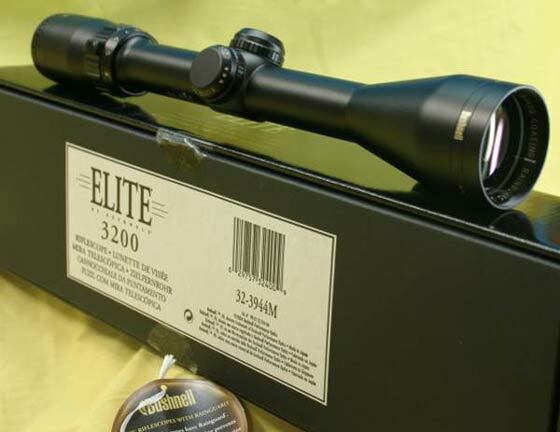 It’s all here: Rifles, handguns & shotguns,Tactical gear, Engraved & custom guns, Latest Ammunition,Rifle, Hanguns, Air Rifles,Gunsmithing Supplies,Muzzleloaders,Firearms products for All. 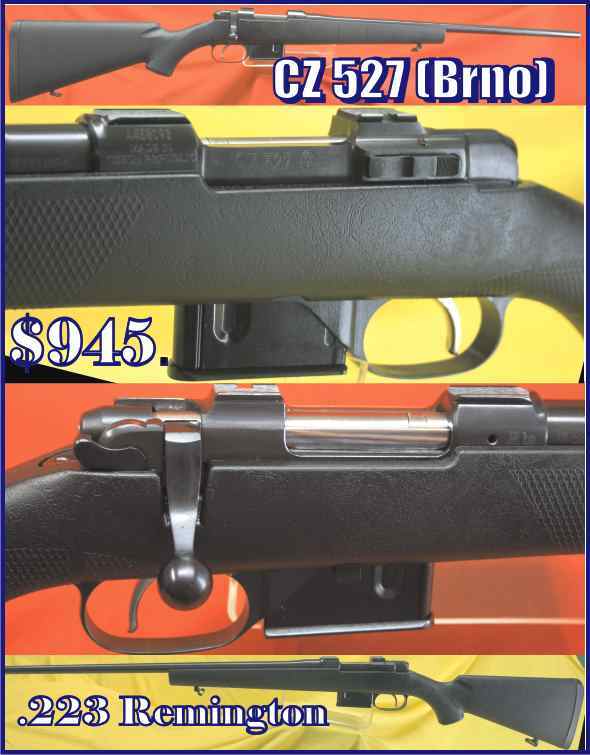 The Marlin Model 925 Is a Magazine loading .22 Bolt action rifle which represents the classic American .22 rifle and is still at a reasonable price for great value. It features an all buisness hardwood stock with QD studs for swivels, 22 inch Micro Grooved Barrel and a 7 shot magazine. Firing pin protrusion, that is the distance that the firing pin projects out beyond the face of the breech block or bolt should be from .050 inch to .075 inch, tending towards the larger amount for large primers and the smaller dimension for small primers, but this differs slightly with different arms, and according to the tolerances allowable in the arm and cartridge. If the protrusion is too small, misfires will occur, while if it is too large it is liable to puncture primers. In fact, with large primers a protrusion of over .080 inch usually tends towards pierced primers. A very small and very important detail on most firearms is the methods by which the protrusion of the firing pin is adjusted and controlled. This is most important in the case of the larger centre fire cartridges, where excessive protrusion could cause the firing pin to pierce the primer and let gas back into the action. 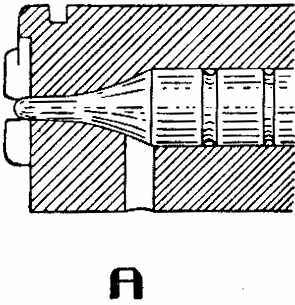 It is generally controlled by the shape of the shoulder of the striker, at the back of the firing pin, as shown in this Mauser photo. Protrusion is closely adjusted and then firing pin face carefully polished into a smooth ball shaped point the only kind of a point used for centre fire cartridges. From diagram A you can see how the firing pin is flared at the back of the point to seal or divert any gas which may be directed through the firing pin hole if a primer bursts for any reason. 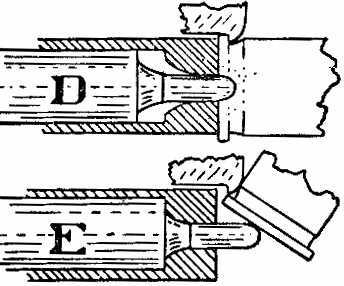 With the smaller rim-fire cartridges, protrusion is equally important; the firing pin “reach” must be controlled so that ‘it will not strike or batter down the “anvil” formed by the breech face of the barrel and thus cause faulty ignition. 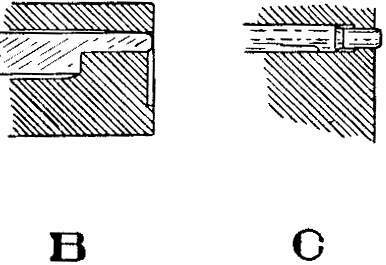 B and C show the methods by which this is generally attained; in B protrusion is controlled by a shoulder on the firing pin and in C by a slotted arrangement with a retaining pin through breechblock. D and E show a novel arrangement where the firing pin serves the dual purpose of firing the loaded cartridge and also acting as an ejector to expel the fired case. D illustrates such action in an Ortgies. 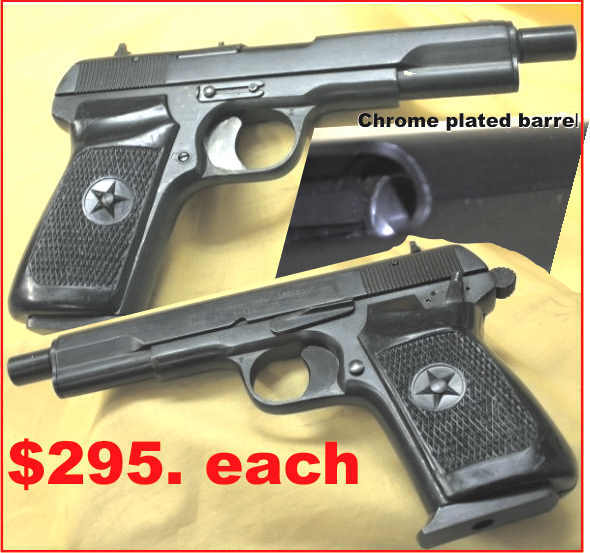 .32 automatic pistol at instant of firing, here protrusion is “controlled” by the action of the primer taking up the impact, which is possible in the case of such low-pressure cartridges. E illustrates same firing pin action as it ejects the fired case at the end of the recoil. 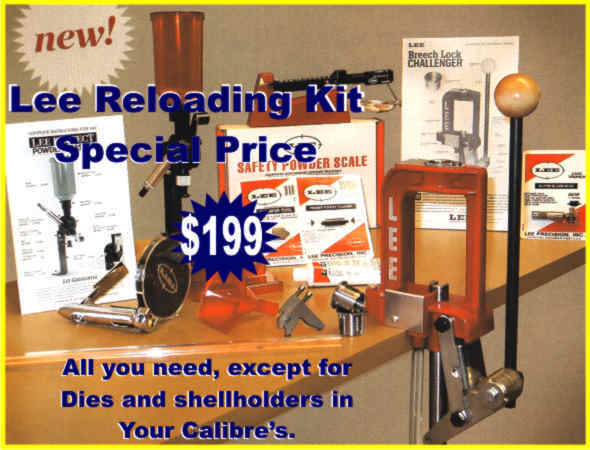 In Bulletin Edition 34 Understanding Reloading Ammunition. We discussed once fired military brass cartridge cases and that they nearly all had a crimp surrounding the primer pocket which the military thought was extra safety insurance for firearms that had oversized headspace and sealed the primer from oil and water contamination. 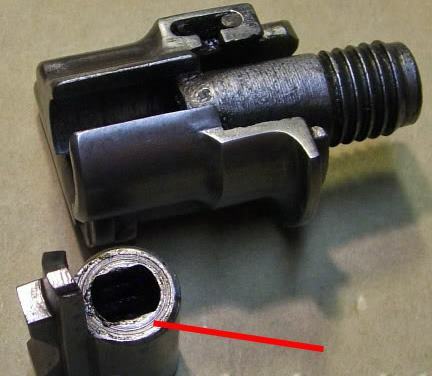 This has never really been proved or found necessary in civilian ammunition and it is an extra inconvenience when you want to replace the primer. As those cases cannot be reprimed until the primer crimp is removed. Brass intruding into the pocket mouth can be cut away, or it can be forced back from where it came from. Reamers are made for the first method, shaped and dimensioned so the original mouth radius will be reproduced and so that the primer pocket will not be enlarged. Lyman and CH makes an excellent hand tool of this type. It may also be cut away with a pointed, sharp knife blade, or grind a screw driver head to the correct diameter and let the edge of blade cut the excess brass off. Care must be taken to avoid removing too much metal or the primer will be two loose. Experiment to learn how little of the crimp can be removed and still allow distortion free repriming with normal pressure. 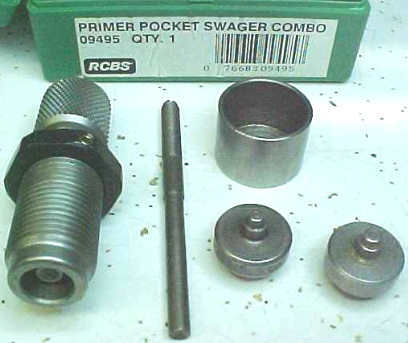 Most authorities recommend swaging rather than cutting out the crimp by forcing a shaped punch into the pocket. 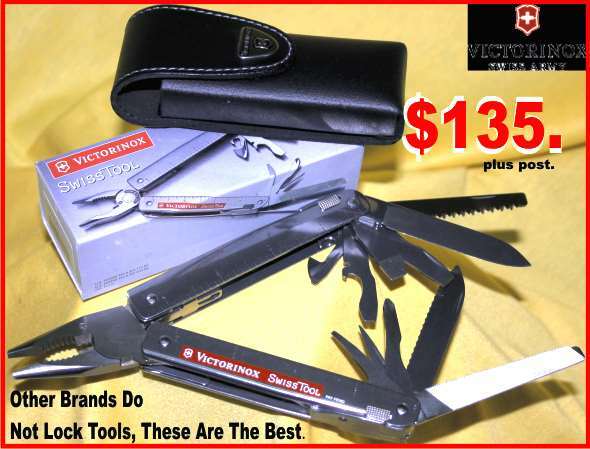 There is a question mark on if it is necessarily any better than properly done reaming or cutting, but it can be faster and more convenient if you have the tools. One quick thrust into the primer pocket and the crimp is forced back to duplicate the original pocket mouth. Pocket swaging setups which hold the case by its rim are not good. The force required to seat the punch often deforms the rim. Best results are found with the type containing a rod over which the case is solidly supported. RCBS makes this type for use in a loading press. A simpler version consists of a base and a punch which is just driven into the pocket with a hammer. It’s cheap and easy to use, and the results are fine if the punch is carefully handled. Once the crimp is removed, such cases are just as serviceable as the un-crimped variety. 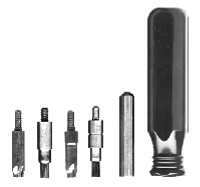 Swaging does work-harden the case head slightly, but not enough to cause any problems. More Reloading Information in Edition 36. James Madison, one of the founding fathers of the United States, or one of those colonist traitors who broke away from the protection of George the Third whilst he was suffering a bout of madness, said. October 6, 2005 which points to miss information and spin that is placed on good news article. I am sure he would not mind us re printing it for the Bulletin readers. “This was the bed-wetting headline of the lead editorial in the August 14, 2005 edition of ‘The Commercial Appeal’ in Memphis. The dead assailant certainly found the shooting to be risky, and the survivor who escaped probably believed that the victim posed too great a risk. But the point of the editorial was, of course, designed to convince us that even though self defence saved a kidnapped man’s life, it is better to do nothing. Makes sense does it not??? Jacob Evans was robbed at gunpoint by a duo of armed thugs two weeks before he undertook his “risky” behaviour. It seems that ‘The Commercial Appeal’ finds nothing risky for a victim to be held at gunpoint by armed robbers. After all, if we do nothing threatening to the assailant, we will convince him that we mean him no harm, right? That way, the assailant will be nice, right? Evans went and bought a .357 from a friend the day after the first robbery. Happily, he was not a day late AND a life short. 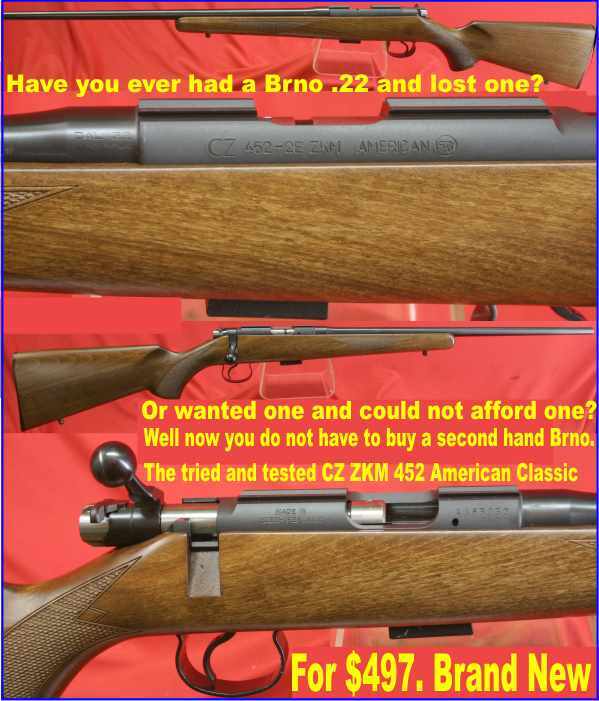 ‘The Commercial Appeal’ complains that the gun had a stuck cylinder, resulting in a very low purchase price. While I would not look for such a deal myself, Evans had an excellent experience with the cylinder’s performance. The punks abducted Evans at gunpoint (they must have by then decided he was their personal piggy bank). They forced themselves into his car and made him drive them to his bank where they ordered him to draw out $10,000. Since Evans did not have a withdrawal slip, one of the duo went to get one. That was the moment that Evans chose to pull out his .357 and shoot the other bad guy who was still in the car. Evans did not just shoot him once, he emptied the gun into Leverett Dickson, hitting him with all six rounds. Good for Evans. He made sure that his kidnapper could no longer hurt him. ‘The Commercial Appeal’ was in a dither that the armed robber might have returned fire before he died. Or, that the accomplice might have returned and shot Evans had the accomplice had a gun. Or that the ensuing gunfight might have endangered an innocent bystander. The anti-self defence crowd does not get it. For the second time in less than a month, Evans was victimized by the same pair. The kidnappers were in the process of looting his bank account. Does the editorial writer really think that Evans was going to be told to drop the kidnappers at their house and be wished a good day? Whatever were Evans’ risks in the actions he took, they were almost certainly less than the risk he faced of being deposited in the landfill later that day. Oh, and the now-in-custody accomplice? Ninety-nine times out of a hundred, bad guys — even when they are armed — flee when the victim starts shooting, because at that point the tables have been turned and the element of surprise is working in behalf of the victim. Which is what bad guy number two actually did. He may have even had a gun, but he did not stay around to use it. As if reading from some gun control talking points playbook, the editorial (in ‘The Commercial Appeal’) raised the problem that a gun might get stolen and be “accidentally discharged by children.” Better that Evans be dead than run the remote risk of some kid stealing his gun. And let’s say it plainly — when the kid steals the gun, he(the kid) is a criminal and certainly does not deserve such sympathy that would paralyse responsible people from defending themselves with guns. The kid who criminally obtains a gun must be responsible for his own subsequent actions. If the kid is big enough to steal the gun, he is certainly old enough to know that stealing is wrong. Had ‘The Commercial Appeal’ been living in the real world, the headline should have read something like: Victim Kills Assailant: Taxpayers Saved Millions in Prosecution Costs. I think they should have given Evans a medal. Then to top it off, and to demonstrate how we should be thinking and acting. Even if this has not been done, it shows how are arguments should be presented and turned to the correct way of thinking. 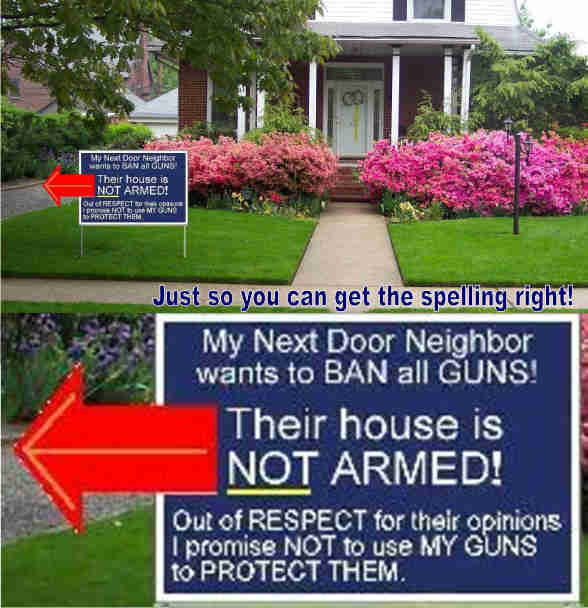 “Vermont State Rep. Fred Maslack has read the Second Amendment to the U.S. Constitution, as well as Vermont ‘s own Constitution very carefully, and his strict interpretation of these documents is popping some eyeballs in New England and elsewhere. Vermont already boasts a high rate of gun ownership along with the least restrictive laws of any state .. it’s currently the only state that allows a citizen to carry a concealed firearm without a permit. This combination of plenty of guns and few laws regulating them has resulted in a crime rate that is the third lowest in the nation. Yes, I know that they have it so good, they don’t appreciate what they have and cannot understand what its like to have the boot on the windpipe, as we get stamped on in Australia, but its not because we are different people, or the country is different, or conditions are different, its just that they think differently so they can express freedom and we have lost it. We are so enslaved we cannot even express what we think to our friends and work mates. Some shooters in Australia, keep it a secret, how can we win anything with a mind set like that?